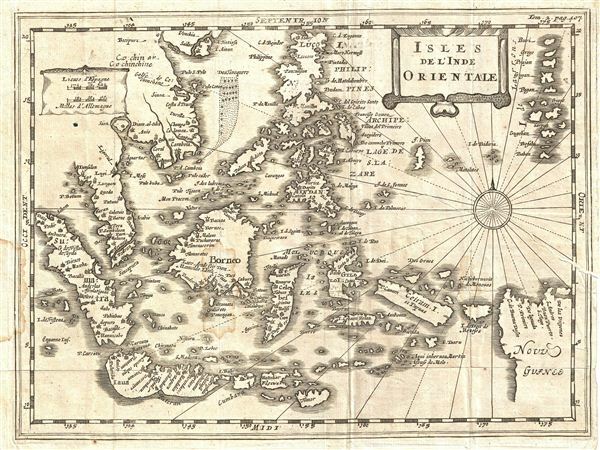 An uncommon c. 1700 map of the east Indies by Phillip Cluver. Centered on Borneo and The Celebes, Cluver's map covers from Sumatra to New Guinea and the Mariana Islands (Larrons), and from Luzon in the Philippines and Halong Bay (Vietnam) to Java and Timor. This map was originally drawn by Cluver in the early 1600s and was reissued many times – often posthumously – well into the early 18th century. The map represents an advanced mapping of the region for the time though many will note indistinct southern boundaries of Java and malformed islands. Sumatra, Borneo, and the Philippines however are roughly correct in form and proportion. The Strait of Singapore (Sincapura) is noted at the southern tip of Malay. This edition of Cluver's map was prepared for Martineau de Plessis' Nouvelle Geographie, published in 1700. Philipp Clüver (also Klüwer, Cluwer, or Cluvier, Latinized as Philippus Cluverius and Philippi Cluverii) (1580 - December 31, 1622) was a German geographer and historian active in Leiden in the late 16th and early 17th centuries. Clüver was born in the Royal Prussian city of Danzig (Gdansk), then a province of the Kingdom of Poland. He study of law at the University of Leiden before turning his attention to history and geography. Cluver traveled, mostly by foot, extensively throughout Europe, spending time in Germany, England, Scotland, Holland and Italy. On returning to Leiden he was given a special appointment as geographer and put in charge of the university's library. Cluver is best known for his general study of the geography of antiquity. A popular Enlightenment era field of study, antiquarian geography attempted to resolve place names known from classical literature but, by the time of the Renaissance, geographically confused. Cluver based his research not only on classical literary sources, but — and this was his primary contribution to the genre — also his extensive and local inspections of sites. Today he is considered one of the founding fathers of historical geography. Cartographically Cluver's most prominent works include his edition of Ptolemy's Geographia (based on Mercator's edition of 1578) and for miniature atlases that were reprinted for most of the 17thand 18th centuries. Cluver was also known as Klüwer, Cluwer, or Cluvier, Latinized as Philippus Cluverius and Philippi Cluverii. He died in Leiden in 1622. Martineau Du Plessis (fl. c. 1700) was a French geographer and schoolmaster from Fontenay, possibly Fontenay-le-Comte. He is best known for his multivolume geography, Nouvelle Geographie issued in 1700. Little else is known of his life. Martineau du Plessis, Nouvelle Geographie, ou Description Exacte de l'Univers (George Gallet, Directeur de l'Imprimerie des Huguetan), vol 2, 1700. Very good. Minor discolorations over Borneo and in left margin. Closed verso repair extending approximatly 4 inches from right center margin. Similar verso repair, from top left margin, not extending into printed area. Original fold lines. Blank on verso.